Spring is here, and spring means farmers markets. It’s hard to beat the farmers markets you’ll find on the Olympic Peninsula. Live music at the Port Townsend Farmers Market. Last year, the Port Townsend Farmers Market was recognized as the best large Farmers Market in the state. Colorful produce lines the stalls, the smell of freshly-baked breads permeates the air, and music sets the mood. People shop, congregate, eat and dance. Is there a better place to be between 9 a.m. and 2 p.m. on a Saturday? We think not. Check out the Port Townsend Farmers Market, Saturday mornings. In a few weeks, the smaller but no less note-worthy Chimacum Corner Farmers Market opens. It starts May 20 and runs Sundays from 10 a.m. to 2 p.m. through the fall. If you happen to find yourself craving fresh produce on a Sunday in Chimacum prior to that, stop by the Chimacum Corner Farmstand. You can’t miss it; it’s the cheerful yellow store in the heart of Chimacum. Spend a weekend on the Olympic Peninsula this spring. Visit Olympic Peninsula Wineries* and taste locally made, Washington State wine. Visit the Port Townsend Farmers Market and stock up on locally grown fresh produce and other treats. Discover the bounty of the Pacific Northwest. * Several of our member Washington State Wineries and Cideries are located in and around Port Townsend. FairWinds Winery is located in Port Townsend. Eaglemount Wine and Cider is located outside of Port Townsend off Route 20, and Finnriver Farm & Cidery is located in Chimacum. Photos from the Port Townsend Farmers Market Video by Oliver Henry. Fort Worden, one of Port Townsend's many perks. Each year, Budget Travel asks its readers to nominate an American small town for the title Coolest Small Town. The choices are then whittled down to the top 10, and those are put to a vote. To our delight, Port Townsend, Washington, has made the 2012 short list for America’s Coolest Small Towns. There are a few parameters. Each town must have a population under 10,000. It must be “on the upswing,” thanks to a vibrant arts scene, good restaurants, or its proximity to nature. The town must also eschew quaint and embrace edginess. Given theses parameters, Port Townsend should be a shoe-in. It’s hip, with edgy artists and a sizable number of residents who live there precisely because it isn’t like every where else. It has astoundingly strong arts and culture for a town of its size, with an impressive list of festivals such as the Film Festival and the Wooden Boat Festival. It has Centrum: Centrum is responsible for the Festival of American Fiddle Tunes, a Chamber Music Festival, a Jazz Festival, a Blues Festival, and a host of other artistic programs. 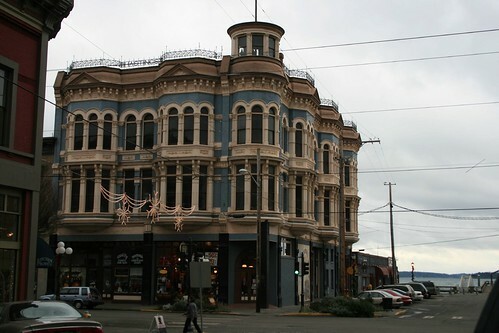 Port Townsend also has beautiful, historic buildings. It has many good restaurants. Grab a hot dog at the seasonal stand or dine at Fins Coastal Cuisine, which has been favorably reviewed in the New York Times Travel Section. Enjoy a drink in the cozy Mezzanine of the Silverwater Cafe or hang with the locals at Sirens Pub. Have a leisurely breakfast Uptown at Sweet Laurette’s, or grab a tasty treat to go at Pane d’Amore Bakery. It’s home to the Port Townsend Farmers Market, one of the largest small town markets in the nation. It’s home to Fort Worden. 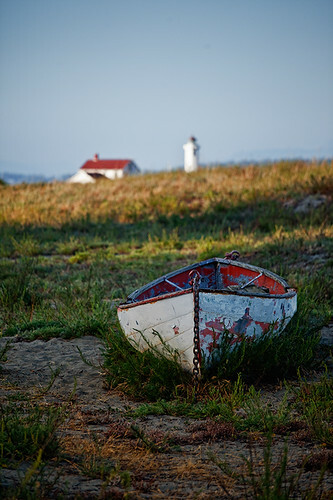 Port Townsend can go neck and neck with just about any town in the country for natural beauty. It sits on the tip of the Quimper Peninsula, which is located on the Olympic Peninsula. Two volcanic peaks stand in the east, Mount Baker to the north and Mount Rainier to the south. The Cascade Mountain Range rises in the distance behind the white cliffs of Whidbey Island to the east, and the snow-capped Olympic Mountains lie to the west. It impossible to remain indifferent to the view. And opportunities for outdoor recreation are abundant. In addition, three of our member Washington State Wineries are located in and near Port Townsend: FairWinds Winery, Eaglemount Wine & Cider, and FinnRiver Farm & Cidery. If you’ve been to Port Townsend, you’ve probably already cast your vote. If you haven’t been there, or if it’s been a while, go take a look. Have a glass of Washington State Wine or Cider made on the Olympic Peninsula. Stay in a Bed and Breakfast or Boutique Hotel. Then cast your vote for Port Townsend as America’s Coolest Small Town. Votes accepted through January 31, 2012.